Follow us on Facebook! And don’t forget to scroll to the bottom of the page and follow the blog! I’m passionate about leader development and want to help others to lead with the best version of themselves. I created this site to provide a platform for leaders to help each other by sharing lessons learned. 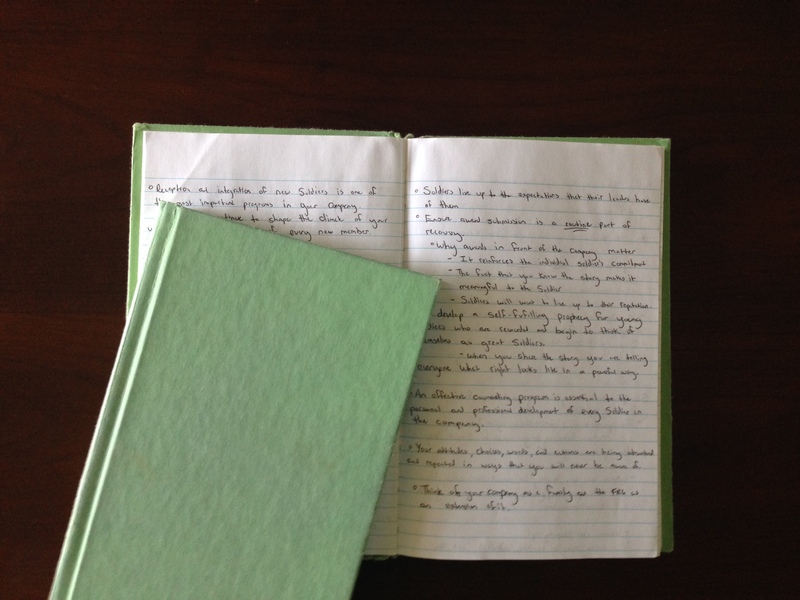 Lessons that come from our own green notebooks. I’m a combat arms officer with over 15 years of experience in combat and training environments. I have been fortunate to have mentors who encouraged me to read, write, and publish throughout my career. I’ve published articles in ARMY Magazine, Military Review, Strategy Bridge, Small Wars Journal, Task and Purpose, Foreign Policy, and many others. I’ve also been featured on Forbes, have been lucky enough to talk about leadership on several podcasts, and have spoken at the Annual AUSA Conference, the Future of War Conference, and Defense Entrepreneurs Forum Annual Conference. I’m an Army Major and professional communicator who cut my teeth as a combat military police officer. I’ve managed brands ranging from startup to global enterprise. I believe in exercising my mind and body alike. I’ve qualified for the Obstacle Course World Championships twice and competed once. I’ve spoken at the Annual AUSA Conference and Georgetown University’s OWN IT Summit. ambassador in my local community. I’m an Army Infantry officer and the founder of Training for 600 where I offer military leaders actionable tools, tips, and advice for elevated performance. My goal is to use credible science and proven fitness insights to provide the link between peak performance and leader development. I hold a Masters in Kinesiology and I’m also a Certified Strength and Conditioning Specialist (CSCS) and Tactical Strength and Conditioning Facilitator (TSAC-F) through the NSCA. This blog represents only our personal views and those of our guest authors. We do not plan on using this space as a platform to complain or provide satirical observations. We want to use this medium to add our thoughts to an already existing expert body of knowledge. Walk into any organization in our military and there is one thing I guarantee you will find on a desk or in a cargo pocket: a small, green, government-issued notebook. it doesn’t matter whether a Soldier is a sergeant or a general officer, odds are they will have one of these military mainstays in their possession. If you are a military professional thinking about writing for publication, I would love to work with you on getting your ideas published. Writing has opened many doors for me professionally, and I want to pay it forward. Joe Byerly is a Non-Resident Fellow at the Modern War Institute at West Point. The Modern War Institute at West Point generates new knowledge for the profession of arms, enhances the West Point curriculum, and provides the Army and the Nation with an intellectual resource for solving military problems. MWI has three mutually supporting functions: Research, Educate, and Integrate. You are doing a great job here. I really appreciate it. Keep at it. I have been a fan of ADM Jim Stavridis’ for some time. Following his lead will take you far and you’ll develop quite a following along the way. I was fortunate enough to have Chuck White both as a faculty advisor and as instructor over twenty years ago–and his book, ENLIGHTENED SOLDIER, was a major inspiration and comfort to me when the military instituation seemed to do things that deeply disappointed. I applaud your efforts in creating this “virtual Military Society” and I look forward to participating in the future. Reading, writing and discussion with others are key to developing one’s knowledge, skills and abilities. Throughout my military career, I was encouraged to read professionally from a prescribed reading list and only discussed what was read within my unit of assignment. The discussions were guided and creative thought was quickly put back into the box. It wasn’t until life after the Army, I was introduced to the trifecta of self development. Blogs and discussion forums like this are where today’s generation and young leaders communicate. Great initiative Joe! Unfortunately, senior leaders I interact with want “one stop shopping” for all professional discussion so they don’t have to monitor a multitude of foums, blogs, social media, etc. This creates a communication divide between senior leadership and todays young soldiers/leaders. My team manages several discussion forums and usage metrics validate the divide. Our metrics reflect that leaders from battalion command and above don’t interact in blogs, forums and social media. As Joe highlights in his article on the Defense Entrepeneur Forum 2013, diversity within his work group offered unique perspectives and opportunities for interaction with individuals from other services and civilian industry. This is where I believe we’re heading as the “green notebook” (no offense Joe) carriers are replaced with digital natives who are adept in navigating professional and social media to read, write and expand their profession through interactive discussion where there are no uniforms, rank, and doors being closed due to creative thought and free flowing opinions. Very interesting blog. I hope you will not mind if I translate (in the future) a few of your texts in Russian? And another question. You are not a relative of the former US ambassador to Russia? No problems. Same name, but I am not related. I would like to use one of the pictures you used on your post. Can you get back to me and let me know. You mentioned having in an interest in helping other military professionals get published. I am a prior enlisted NCO and Commissioned Officer. I would love some guidance. Shoot me an email and let’s talk! Left a comment on recent S6 article, but it’s still awaiting moderation. Did I do something wrong? Thanks. No you did not. Sorry about that. I’ve been traveling a bit. Another book worth reading is Through the Valley: My Captivity in Vietnam (Naval Institute Press, 2016). Naval Institute’s Author of the Year and the Army Historical Foundation Distinguished Writing Award for 2016. A story of courage, hope, and survival. First, you’ve got a great website and a great resource! I’m always impressed by the material on this website. For the leadership book list, I wanted to say that “Duty” by Robert Gates was a great read from my perspective. The book is well written, easily digestible and contains some very valuable lessons on running large, bureaucratic organizations.